The TH5 Tilley Hemp Hat, designed with a medium brim, is made from a breathable hemp fabric that is naturally resistant to UV light, mould, mildew and salt water. 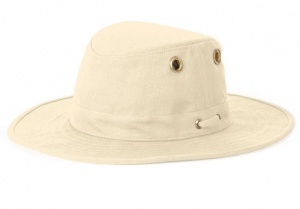 Although the Hemp Hats have a soft linen-like look they have a 'tough as nails attitude'. Hemp - Nature's performance fabric™. Wash it frequently or non-removable sweat stains will mar it and possibly rot it. Machine wash on delicate cycle separately or hand wash in cool water. Do not use bleach as it remains inside the Hat, slowly rotting it. Smooth and reshape the Hat by hand and set it out to air dry. When the Hat is dry, simply re-stretch it, as an American sailor showed us, by putting your knee in the crown, and pulling firmly on the opposite side.